Monday of our Spring Break staycation: Light snow mixed with cold rain. Not quite the spring weather I was hoping for. Good day to stay inside. Our puppy is 5 months old. View from my sewing room window. DD2 comes in my room and starts setting up a game she knows I will always play with her: Quiltopoly. Please Mom??? How can I resist? I thought you might enjoy seeing this game too. It's a fun one for quilty-minded folks. Just like the regular Monopoly game, you go around the board collecting properties - which in this case are block patterns. When you collect a color set, you can purchase quilting studios and shops (compared to houses and hotels in the original game). My daughter happily beat me at our round of play. 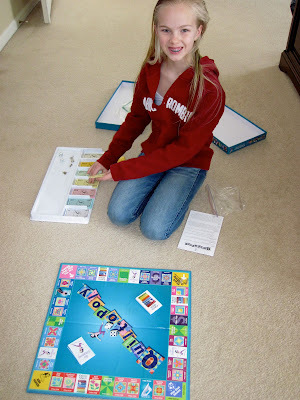 Maybe next time she'll pull out my other -opoly game: Stitchopoly! This one is all needlework related. I've cut out a bunch of squares to make potholders on my treadle. Can't wait to try it next. What a cool game! The weather isn't much better here, I am ready for spring! What a cute version of Monopoly! I love the game pieces. And I know several people who would like a copy of that game. :-) P.S. Board games are SO good for kids! OMG! I want this game! It looks so cool! 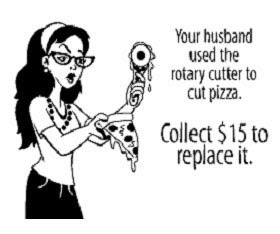 And the card about the hubby using the rotary cutter to cut pizza is hilarious! Thanks for sharing @ Submarine Sunday! What a neat game and the little pieces are so neat, hope you had fun! Thanks for sharing.